Check out this hard-to-find shotgun coming up tomorrow, 3/30 at Poulin Auctions. It’s a 12 gauge J. Dickson & Son boxlock ejector with short, 2″ chambers. Twelve gauge shotguns with two-inch chambers were popular in the 1930s. People liked how they were lightweight guns, but they were still big enough to feel right to people who had always shot 12-gauge guns. Today, these doubles are awesome side-by-sides for upland hunters. 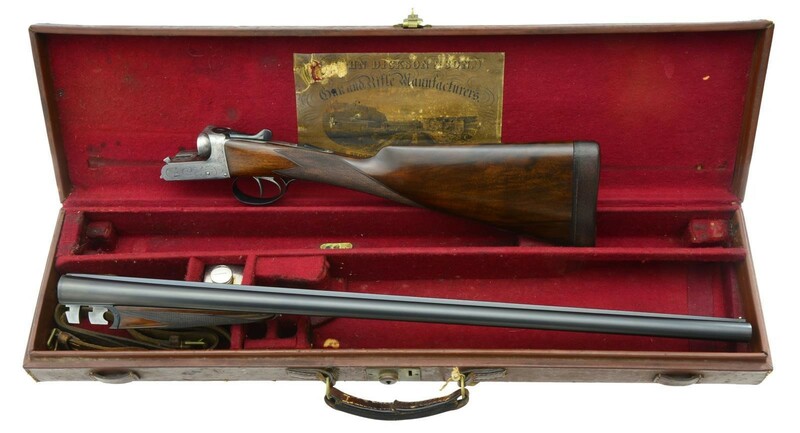 LOT 1067: J. DICKSON & SON TWO INCH BOXLOCK EJECTOR SXS SHOTGUN: Cal. 12 Ga. S# 18014. Bbls. 27″ w/ Churchill rib. Ribbed surface is hand filed. Choked .007″ / .017″ (Light Imp. Cyl. / Light Mod.). Dbl. triggers. Ejectors. Auto safe. Bbl. lockup is via dbl. under lugs. Action is in the white. Blued bbls. & furniture. Checkered walnut straight hand stock w/ splinter forend. Action decorated w/ acanthus scroll plus “John Dickson & Son” in a banner on each side. LOP: 14 3/8″ over 1″ leather covered pad. DAC: 1 3/8″. DAH: 2 3/8″. Cast off: 1/4″. Minimum measured wall thicknesses: .032″ left & .036″ right; both measured 8″ from muzzle. Weight: 5 lbs., 12 oz. UNATTACHED ACCESSORIES: leather very compact case w/ red baize lining. Accessory compartment in case holds case straps. Also includes Dickson & Son oil bottle & 2″ snap caps marked “MORTIMER & SON”. CONDITION: like many British guns, this Dickson has been freshened still retaining 95%+ bbl. finish w/ crisp engraving on the action & deep rich blue on the furniture. Wood shows minimal marking w/ 95% freshened finish. Checkering remains crisp where recut. Initial plate is engraved w/ “LCT”. Leather covered pad retains its dark brown color. Bottom of bbls. stamped w/ “GRIFFIN & HOWE” import marks. Bbl. 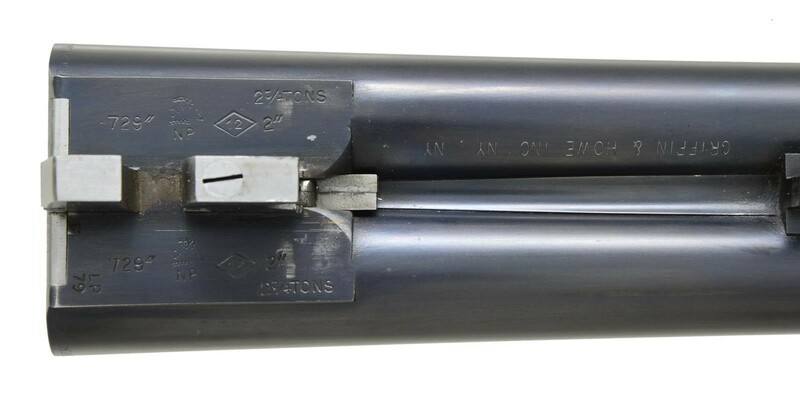 flats wear 1979 London proofs w/ bore diameters marked at .729″ (still measure). Bright shiny bores. ESTIMATE: $1,500-2,500.